Hi Friends! So I am super excited with my new skin care routine and wanted to share it with you. I am starting to use 3 products following washing my face and i am beyond OBSESSED. I started using these products only a week ago and am starting to notice a tremendous change in my skin and LOVE it! The first 2 I want to talk about are from Valjean Labs. 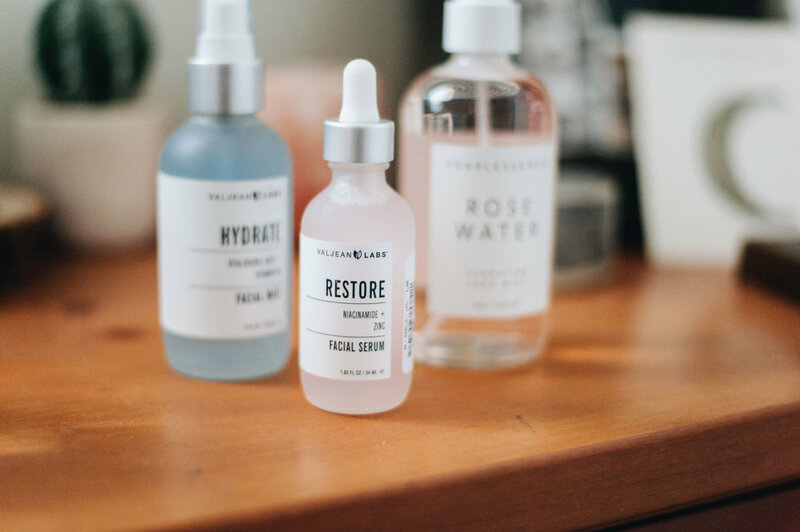 These facial serums are so gentle and you can actually feel them doing something right after you apply them. The 2 I am using are RESTORE and HYDRATE. I noticed they also have a 3rd and 4th called CLARITY and GLOW.. But i am not currently using that one yet! (key word YET). This one in particular I wanted to try because of my scaring on my face, Through my years in the sun, playing waterpolo in chlorine, crazy hormones and more.. my skin has definitely taken a beating. I have tried EVERYTHING! I have used Mederma, oils, Retin-a and more.. and it felt either overly aggressive leaving my entire face red and sensitive or I wasn't allowed to go in the sun after usage.. I mean come on! How do you avoid sunlight in Huntington Beach?! So what is in this product?! Niacinamide seems like a scary word at first.. but the benefits of it are amazing. it's just a big fancy word for Vitamin B3. It’s a good all-rounder and improves the health of your brain, heart and liver, as well as your skin. It’s one of those all-rounders that helps to keep your skin hydrated and firm, with the added bonus of soothing acne. Zinc, when applied to the skin, treats acne, aging skin, infections, and to speed wound healing. The cool thing about using zinc in skin care is that not only does it help heal, but also helps prevent future damage to the skin. I love this product because I still am swimming, surfing, running around etc which causes my skin to become EXTREMELY dry and flakey! So I figured anything could help.. wrong I have tried yet again EVERYTHING. But nothing has moisturized my face evenly. I noticed with certain products i will be super oily on my cheeks but my nose would still be flakey and dry. This spray has changed that significantly! So whats in this product?! As body collagen declines with age, the appearance of wrinkles and discoloration become more visible. Hyaluronic Acid keeps collagen synthesis up, as well as retaining skin moisture, contributing to the anti-aging benefits to the skin. Vitamin B5 is absorbed into the skin to help with natural abilities to moisturize, soothe, heal and regenerate the skin. The 3rd and final product i want to talk about. I have been using Pearlessence Rose Water over the past couple of weeks. I will use it instead of a toner after cleansing (before using my first 2 products) or I actually use it through out the day to freshen up. I like to use it similarly to a setting spray after applying makeup to not only look a little less powdery.. but it also helps make my makeup feel a lot lighter on my skin. What is the hype about rose water?! Well it is a great alternative to a toner that not only smells good, but is a gentle and natural alternative for sensitive skin. Its mild astringent properties help tighten the pores and gently skin... And I love it! I hope that you enjoyed a little bit of my insight. My skin is far from perfect but these products are safe and natural alternatives out there that I have found to really work with my skin. AND to my fellow Vegans out there.. it is animal cruelty free!